As you prepare food, you naturally move between three places where you do three different tasks: clean-up, cooking, and food storage your sink, cooktop and refrigerator, respectively. Imagine a triangle that connects them. 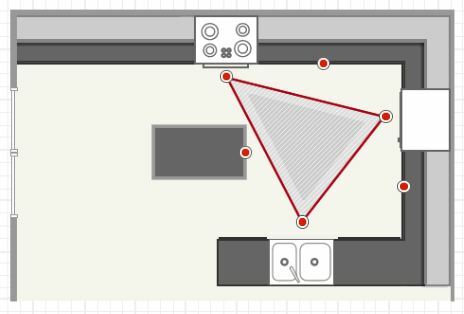 This is your work triangle, and it’s the heart of your kitchen design. Ideally, each side should be at least 4 feet long, but less than 9 feet long. Of course, you’ll also need a place for food preparation like cutting, and the most efficient place for that is within your work triangle. It could be a countertop on an island, or between the cooking and food storage zones. To view more information on the different task zones, mouse over the corresponding hotspots . This is so true you need to keep this in mind when designing your kitchens. Clients need to under stand that work space and the way you use all three main components this way.